How Do You Expand a 142-Year-Old Church? 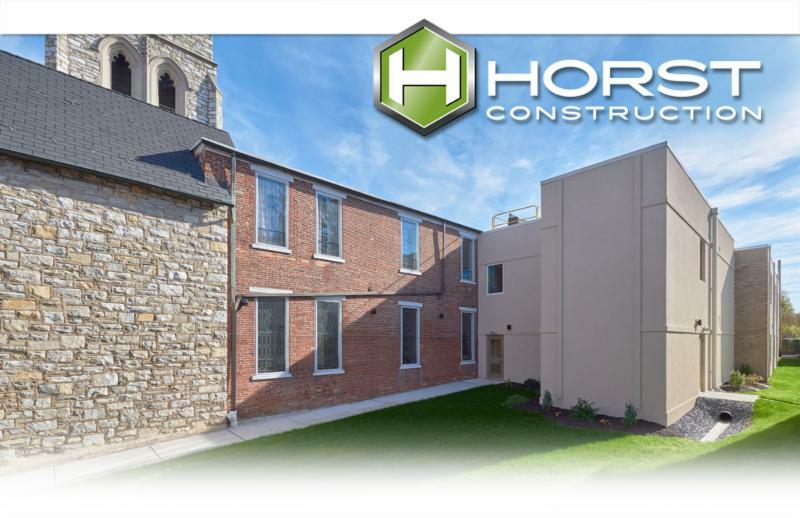 Last year, Horst Construction was proud to complete Phase 1 of Trinity Evangelical Congregational Church’s Master Plan. Much of the conversation for this phase involved addressing the needs of both an aging membership and new families with more diverse interests. The new elevator enables access to classrooms, the fellowship hall, sanctuary, handicap bathrooms, and other bathrooms on all three floors. Major renovations to the kitchen, fellowship hall, and narthex, as well as relocation of the existing HVAC condensers to the roof of the new addition were also included in this phase. While there are more improvements and additional capacity to come during the next Phases, we’d like to share our experiences with others who may be considering renovations to their own historic structure. When approaching a potentially complex project in an older building, identifying hidden conditions is crucial. The process was more complicated than usual for Horst and its partners, since drawings for Trinity were only available for the 1970’s addition, not the earlier structures. One of the major challenges of this project was developing a strategy to accommodate current and future project needs while keeping costs under control. The original elevator expansion plan required working around the parsonage house on the adjacent lot, which would have required significant shoring costs of approximately $70,000. By addressing this challenge immediately the church saved $40,000, which also helped everyone more easily envision the future addition.